Because of the threat of inclement weather, my clinic was cancelled today. So I headed to Dr. Stallcup's beautiful place to hunt a little and to take pictures. It is snowing now, but the last 24 hours have produced a LOT of rain. 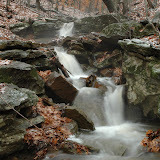 With rain and the steep terrain in this area, many waterfalls pop up. Below is a link to some that I took. I am looking forward to getting some more if my clinic is cancelled tomorrow.